Permanent deacons - a solution to the shortage of priests? While the Catholic Church in Ireland tries to address a shortage of priests there has been a concerted move to re-introduce an ancient ministry - that of permanent deacons. One hundred men, many of them married, have been ordained to serve the community and assist priests in parishes across Ireland. The Vatican has set up a commission to consider women serving in that role and the history of women deacons in the Church, signalling an openness to ending the practice of all-male clergy. The Reverend Malachy McElmeel was ordained as a permanent deacon three years ago. As a permanent deacon he can perform baptisms, marriages and funerals, in the same way a priest, but cannot celebrate the Eucharist or hear confession. Speaking to BBC News NI Reverend McElmeel said being a priest was not for him, but felt a calling to ministry as a permanent deacon. "I am a married man, I have a lovely family, and being a priest was never on my scale," he said. The Armagh man also has a business involved in adapting cars for people with disabilities. He preaches sermons, assists the priests at Mass, and is involved in pastoral work in the parish of the Holy Family in Coalisland, County Tyrone. Father Paul Byrne says the ministry of permanent deacons is not a response to the shortage of priests. He says the role is independent of the work of the priest, but acknowledged that by carrying out functions at baptisms and weddings, the permanent deacon has "freed-up" his time and he can focus on taking a more active role in other areas. Deacons are one of the three orders of ordained ministry in the church, after bishops and priests. Permanent deacons are men ordained to an office in the Catholic Church who normally have no intention or desire to be priests. 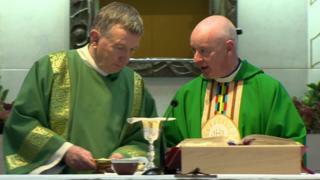 Watch the full report on permanent deacons on BBC Newsline at 18:30 GMT on BBC One Northern Ireland.